Sponsored children reflect on their experiences with our sponsorship programme as successful adults. 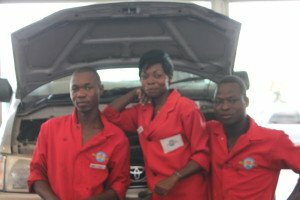 Meet Phanny – an automotive repair supervisor in Zambia. These are the words of 28-year-old Phanny, a supervisor at Autoworld, which sells an extensive range of automotive, marine and lifestyle products in Zambia. Phanny’s parents died when she was only four years old, and none of their relatives offered to take in Phanny and her 16-year-old sister after they were orphaned. So, the sisters remained in their parents’ home, and Phanny’s sister dropped out of school and resorted to doing odd jobs so that they could survive. Phanny’s big breakthrough came when her sister heard about the ChildFund sponsorship programme (then, Christian Children’s Fund) and the girls were immediately enrolled in programmes at Tiyanjane Community Association. With support from her sponsor, Phanny sailed through primary school and qualified for secondary school with good grades. 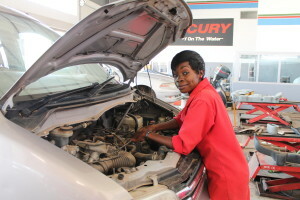 She completed school in 2006 and decided to study motor vehicle engineering. In 2009, she started working for Autoworld as an assistant motor vehicle technician. She rose through the ranks through her commitment and love for the job. Today, she is the supervisor and still the only female at Autoworld’s downtown branch. She and her sister live together in a nice house, and Phanny’s sister no longer has to take odd jobs. About her future plans, Phanny explains that she wants to further her education and open a garage of her own so that she can support other children in need in her community. Sponsor a child now and they can grow up to be like Phanny!